It was raining like crazy. But by the time we reached Agashiye at 9 pm, the rains were down to a drizzle. Our destination was a building situated at the center of Ahmedabad. Or to be precise, the terrace of this building. We were going there to enjoy an authentic Gujarati thaali. Agashiye is a restaurant on the top of a century-old bungalow located right in front of the famed and beautiful Sidi Saiyyed ki Jaali. This bungalow was built in 1924 by Mangaldas Girdhardas Parekh, a textile tycoon. In 1994, his grandson Abhay Mangaldas converted it into a boutique hotel with a fine dining restaurant on the terrace. When we reached the house of MG (as it is called), there was a queue of people waiting for tables, even in these heavy rains. We waited on the ground floor. The red brick walls and yellow lamps created a warm atmosphere. Within 15 minutes, we were accosted to the 4th floor. The place seemed very calm considering the fact that the area is a very high-traffic zone. The starters began soon after we sat. Khaman, vada and chaat with 2 types of chutneys. I gorged on them forgetting that the main course was yet to come. My stomach was full with the starters itself! Followed by khichdi. With more ghee than I had consumed in the last 6 months. Food was delicious. In the end, paan and 8 types of mukhvaas. Abba! I felt like a python who had swallowed a deer. With enough food in my system to last 2 weeks, we walked down the 4 storeys. Not to aid digestion but since we were the last to leave, they had shut the lift down. 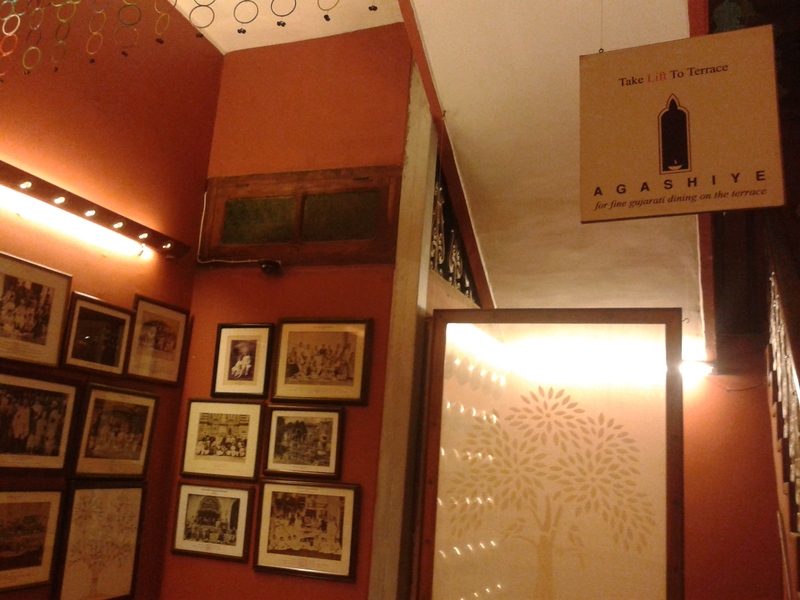 As we descended, we had a look at the historical photographs – black and white pics of a bygone era of Ahmedabad. 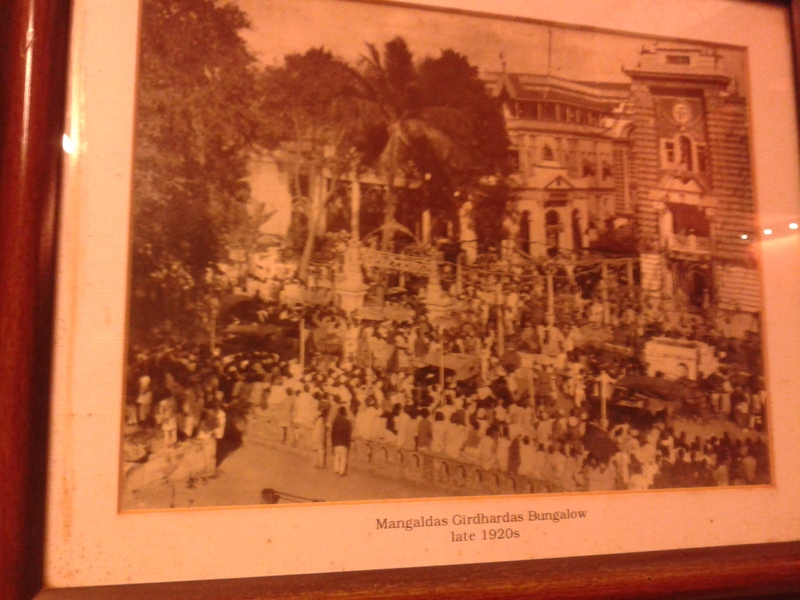 The MG bungalow in 1920s. 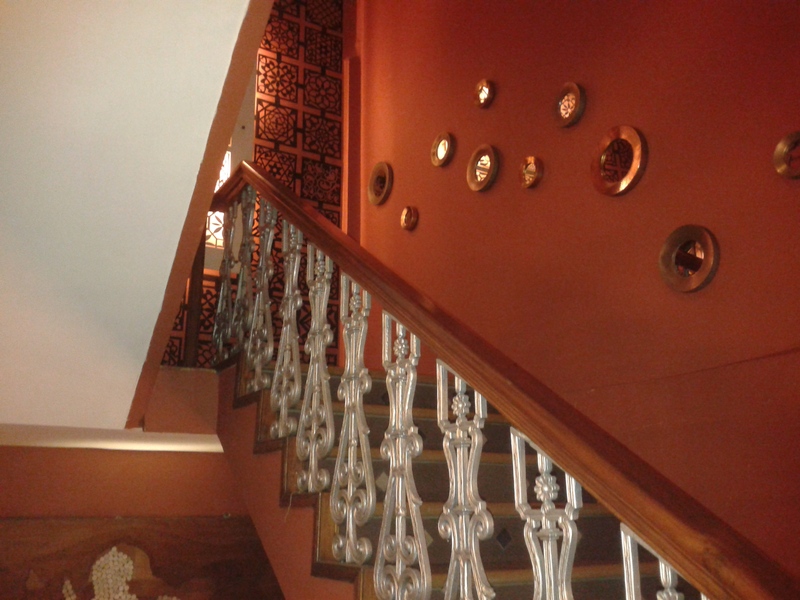 Reddish walls inside the MG bungalow. Hi Pranav – Recently while visiting Ahmedabad for your sister’s wedding, I had the pleasure of having lunch the downstairs green house and it was very good. What was even more important was that the company we had. Chetan, Mihir, Saroj masi, my parents and Jyoti masi. It was to be my last restaurant meal with Jyoti masi which made it all the more special. I have always wanted to actually stay there and what was quite cute was the little boutique off to the side, quite expensive but did have some rare stuff. Thanks Bindu masi and Jaideep bhai. Great to know that the post brought back some good memories. It is a wonderful place, we had lunch in the smaller ‘cafeteria’ on the Ground Floor and it too had character and delicious food.Thanks Pranav for bringing back so many happy memories of our visit to the house of Mangal Girdhar. All 4 of us sisters and 2 dear friends went to it in our “Gujarat Darshan” trip a few years ago.